There is nothing a bride and groom want more than to get hitched without a hitch. Behind the scenes, the wedding party scrambles to avoid any major issues. 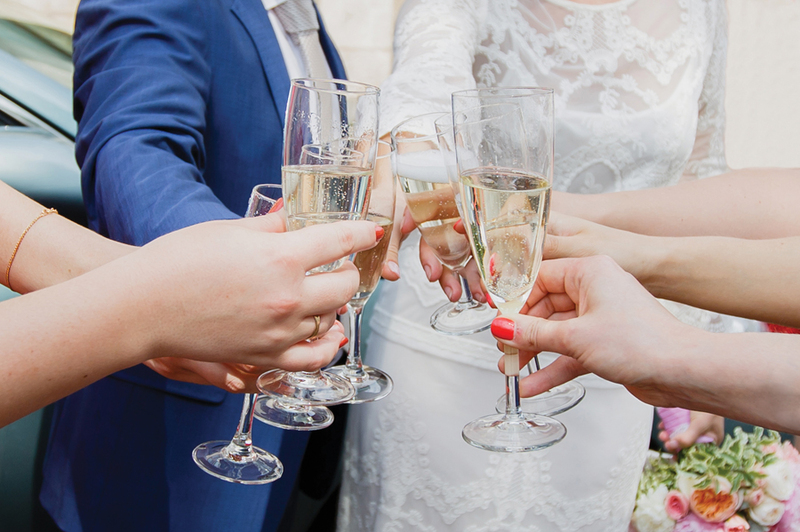 Guests, although not technically members of the wedding party, still play a huge role in making sure the day ends in nothing but a blushing bride and a golden groom. A few simple gestures could mean the difference between a picture-perfect day or a frustrating experience for the couple, so make sure you’re contributing to the former. Always, always respond to the wedding invitation in a timely manner. The couple will use the responses as a guide for seating charts, food and drink quantities and other plans — many of which need to be finalized far in advance of the actual date. Even if you are not planning on attending the wedding, you still need to let the couple know. Don’t worry about hurt feelings. The couple will be much more upset if they assume you’re coming and you don’t show up. Try to avoid bringing cameras or cell phones into the wedding ceremony. The couple will likely have already paid a professional to photograph the wedding. When guests try to take photos during the ceremony, they can get in the way of the paid photographer’s shots and distract other guests, or worse, the bride and groom. A guest’s responsibilities at a wedding are simply to be present and observe. (And cell phones can be even more embarrassing; Just imagine one chiming as the couple reads their vows or leans in for their first kiss. You don’t want to be the one who accidentally interrupts those precious moments!) So, leave the phone in the car until the reception, then feel free to hashtag to your heart’s content. What better gift than one the bride and groom handpicked? They’re telling you exactly what they want — all you have to do is listen. As a guest, you can’t be sure what the bride and groom do or do not already have, and following the registry solves that issue. Be sure to confirm your order so that other guests know that you’ve already bought a particular item. If you don’t like the gifts on the registry or think they’re a bit too pricey, then cash or gift cards are highly appreciated. This is a great alternative to ensure that the bride and groom will receive something that they actually need. Check the wedding invitation for the section that says “and guest.” If this is not printed on the invitation, then there’s probably a reason. It’s impolite to bring uninvited guests to a wedding. The couple plans for food according to their projected guest list, so extra mouths to feed could become a real problem. This rule applies for families as well. If the invitation says “and family, ” then it is acceptable to bring your children. If it doesn’t, the event may be for adults only. And, of course, be sure to RSVP for all guests, as well. You know what they say: If you’re early, you’re on time, and if you’re on time, you’re late. Go the extra mile and be punctual for all events. Plan to arrive at the ceremony venue 20 to 30 minutes ahead of the scheduled time. This accounts for traffic, parking and any other unforeseen mishaps. Plus, nothing spoils a moment like guests sneaking in the back after the ceremony has begun. Know your limits. It’s not classy to drink irresponsibly at a wedding. The happy couple should be able to enjoy their special day without worrying about overly intoxicated guests. Worse still, depending on the inclinations of family and other guests, drunkenness can be embarrassing or upsetting to the newlyweds. Also, make sure your party has a designated driver or have Uber ready to go on your phone. Yes, we know those crab cakes smell delicious, but that doesn’t mean you should wrap four in a napkin and stuff them in your pockets for later. Most likely, those small appetizers are meant to hold you over until the main course is offered at the reception. So, use those cute little toothpicks in the corner to grab a cube or two of cheese as a light snack instead of filling up. And whatever you do, don’t go sneaking a taste of icing on the wedding cake before it has been cut! Of course, the bride and groom want you to celebrate the big day with them. And yes, the couple will extend their appreciation to you for attending at some point during the reception. However, don’t linger in conversation, and don’t be offended if the newlyweds don’t stick around to chat for too long. It’s a long day for the pair. Most likely, they have a lot of guests to speak with. So sometimes just enjoying yourself after a quick hello is more than appreciated. Weddings are all about having a good time. As a guest, you are there to celebrate love and new beginnings with the people you care about most, so have fun! The last thing the happy couple should worry about is whether or not their guests are enjoying themselves. So, cut loose, dance the night away and make some great memories!